After my free Super 8 motel continental breakfast of two slices of french toast, three glasses of orange juice, two chocolate donuts and two cinnamon rolls, I headed straight north for the beautiful state of Minnesota, traveling a total of 421 miles through three states (Iowa, Minnesota, Wisconsin). Well, if it makes you feel better, the chocolate donuts were the bite-size kind, and the cinnamon rolls were the size of a half dollar. (For those of you younger people who have never seen a half dollar, it is approximately one inch in diameter) So I didn’t total overdo it for breakfast. I did skip lunch and had a late dinner. Okay, now on to the trip. Here is a picture of Minnesota. Pretty much like Iowa and Nebraska and Wyoming…Flat. Here is Wisconsin. A beautiful state with a lot of trees. 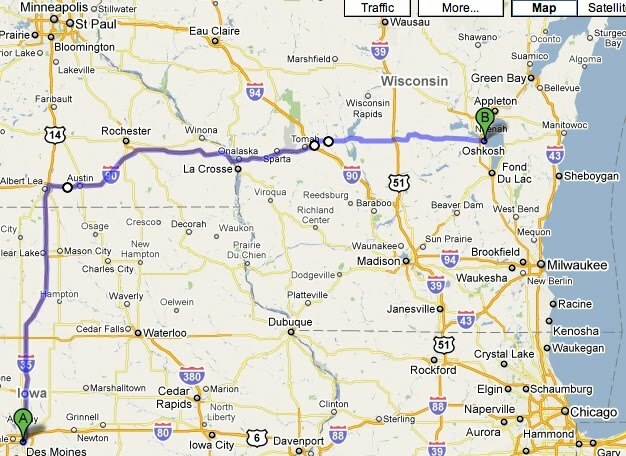 My GPS took me on a shortcut, off of the interstate to reach Oshkosh, Wisconsin and Lake Winnabago, my final stop for the night. I’ve had some of you ask how I can endure the long stretches on my bike. Well, I’m kind of tired from the long day, all those one handed push ups and sit ups, so I’m going to retire.